Two more sports cars planned by the Japanese automaker with FR-S/GT86 to sit in the middle. If you&apos;re a fan of the Scion FR-S (aka Toyota GT86 or Subaru BRZ), then you&apos;ll be thrilled with the latest news from Top Gear. Speaking with FR-S chief engineer Tetsuya Tada at an international media event in the Philippines, Top Gear discovered that the nimble little sportscar is just the first of a trio Toyota has planned. While you might expect that to translate to two more upscale models, the GT86 will actually ultimately emerge in the middle of the sportscar trifecta. "The first is more mass-market and cheaper than the 86," Tada revealed. "And the third is more upmarket than the 86." Still in the conceptualization stage, the pair of new Toyota sports cars are five years from production, with the higher-end model potentially to stand as the successor to the Supra. The lower-end model could take up the place of the MR2, but likely not with a mid-engine layout. 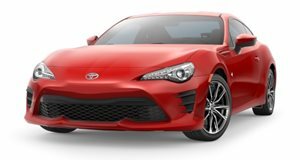 With the FR-S sold in the United States as a Scion and the LFA as a Lexus, the jury&apos;s still out on which brand the pair will be marketed under, though.